There are many nations and countries that participate in the sport of archery at the Olympics. While there can only be first, second and third place winners, any of the archers who perform here are considered to be elite and are pure pleasure to watch. Of course, most people are enthralled with the presentations of the medal winners and many times means placing all the focus on the archery athletes from South Korea. Most Olympic enthusiasts do not know what to expect when watching archery as an Olympic sport. However, S. Korea has proven this to be wrong with their latest competitions at the 2016 Olympic games. The archers from this country were able to walk away with the gold medals in all four competitions. If one were to look at the total accumulation of S. Korea’s gold medals for archery they would see that it amounts to 23 out of a total of 39 medals from the Olympics in total. 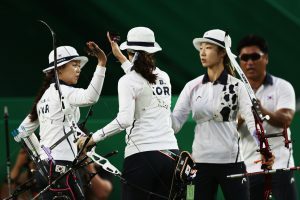 For those that are under the impression that it has been mostly the male archers to be so impressive at the Olympics, it should be kept in mind that the women have won every recurve event that they have participated in at the Olympics dating back to 1988 when they first became part of the Olympics for this event. With such an impressive record it stirs up the interest in many archery enthusiasts to determine why the archers from this nation are so skilled. Many will realize that the use of bows and arrows by the military dates back many centuries. In these early beginnings, the release of the arrows was performed by the archers on horseback. There is little doubt that these ancient skills have been passed on down through the generations.